The following are the latest results contributed by HM Courts Service, for cases sentenced by West Sussex Magistrates’ Court sitting at Worthing from July 17 to 21, 2017. Christopher Booth, 41, of Alberta Walk, Durrington, was fined £300 and must pay £50 compensation, £30 victim surcharge, £250 costs, after being found guilty of assault by beating in Worthing on November 28, 2016. Paul Feest, 48, of Whitebeam Road, Durrington, was given a community order and must carry out 120 hours’ unpaid work after admitting breached a non-molestation order by telephoning in Worthing between May 31, 2017, and June 3, 2017; and breaching court bail conditions. He was given a restraining order and must pay £85 victim surcharge, £85 costs. Stephen Phillips, 42, of Harvey Court, Blackbourne Close, Littlehampton, admitted breaching a suspended sentence order, which was revoked. He was dealt with for the original offence, receiving a 16-week prison sentence, suspended for 24 months, for stalking in Bognor Regis between December 8, 2014, and January 14, 2015. He was given a six-weeks consecutive prison sentence, suspended for 24 months, after admitting harassment through numerous text messages in Littlehampton between June 27, 2016, and July 31, 2016. He was given a restraining order and must pay £115 victim surcharge, £250 costs. He also admitted breaching a conditional discharge order and was dealt with for the original offence of common assault, receiving no separate penalty. Mandy Darke, 51, of Salvington Road, Worthing, was fined £120 and must pay £339.59 vehicle excise back duty, £85 costs, after admitting using an unlicensed vehicle on the A23 Pease Pottage on August 9, 2016. Karlie Everson, 30, of Norfolk House, Worthing, was fined £30 and must pay £50 costs, after admitting breaching supervision requirements following release from prison. Kenneth Beattie, 32, of Dorking Court, Copper Hall Close, Rustington, was fined £288 and must pay £30 victim surcharge, £85 costs, after admitting drink-driving (91mg of alcohol in 100ml of breath) in Sea Lane, Rustington, on July 1, 2017. He was disqualified from driving for 24 months. Adam Chiswell, 25, of Kingsland Close, Shoreham, was fined £80 and must pay £30 victim surcharge, £150 costs, after admitting obstructing a police contable in Shoreham on April 28, 2017. Ernest Doll, 58, of Pavilion Road, Worthing, was given a community order with 16-week curfew, electronically monitored, from 9pm to 6am daily, after admitting drink-driving (98mg of alcohol in 100ml of breath) in Pavilion Road, Worthing, on July 2, 2017. He must pay £85 victim surcharge, £85 costs, and was disqualified from driving for 24 months. Geraint Harding, 27, of The Lawns, Sompting, was fined £120 and must pay £30 victim surcharge, £85 costs, after admitting driving without insurance in The Lawns, Sompting, on March 17, 2017. His driving record was endorsed with six points. He was fined £80 after admitting using a vehicle with a tyre that did not meet the 1.6mm minimum tread depth in The Lawns, Sompting, on March 17, 2017. 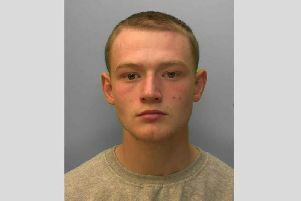 Aaron Melloy, 28, of Hammy Lane, Shoreham, was discharged conditionally for four months and must pay £20 victim surcharge, £85 costs, after admitting resisting a police constable in Shoreham on June 15, 2017. Deborah Wiltshire, 21, of York Road, Littlehampton, was given a community order with rehabilitation activity requirement and must pay £50 compensation after admitting assault by beating in Littlehampton on April 11, 2017; and breaching a criminal behaviour order by using violence towards a person, causing distress.